Patients suffering from osteoporosis or bone fractures might benefit from a new discovery of a protein that plays an important role in bone regeneration made by bioengineers at Queen Mary University of London. 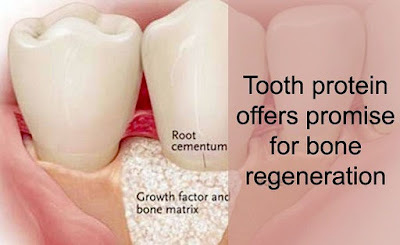 Normally found in the formation of enamel, which is an important component of teeth, the scientists discovered that a partial segment of the protein statherin can be used to signal bone growth. “What is surprising and encouraging about this research is that we can now use this particular molecule to signal cells and enhance bone growth within the body,” said co-author Dr Alvaro Mata from QMUL’s School of Engineering and Materials Science and the Institute of Bioengineering. Publishing in the journal Biomaterials, the team created bioactive membranes made from segments of different proteins to show which protein in particular played the crucial role. They demonstrated the bone stimulating effect in a rat model, and used analytical techniques to visualise and measure the newly formed calcified tissue.